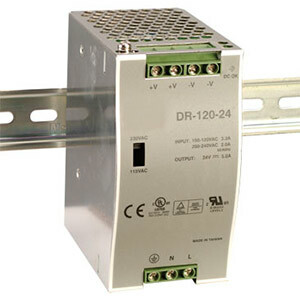 The DR series of power supplies provides a reliable DC power source for any industrial control system. These economical and reliable power supplies for industrial devices (PLCs, stepper drives, sensors, switches) are designed for use in harsh industrial environments. Combining rugged, compact enclosures, incorporating all international standards and approvals, and offering short-circuit, over-load, over-voltage, and over-temperature protection, the DR series makes your power supply choice a simple one. These high quality power supplies have passed a 100% full load burn-in test, and are UL/CUL listed, TUV/CB certified, and CE marked. Models are available with output ratings from 75 to 240 W, with 24 Vdc output. Customers can choose from a full range of input voltages (85 to 264 Vac and 120 to 370 Vdc compatible) making the DR series unbeatable.